WINTER FAMILY FUN DAY has been rescheduled!! Saturday, March 2nd from 1:00 to 4:00 p.m. There will be a variety of FREE drop-in outdoor activities for the whole family to enjoy. Join us for snow painting, snowshoeing, snow fort building, hot chocolate, and much more! Our fourth annual Hangin with Dad happened on Saturday, November 24th at the Mill Woods Seniors Activity Centre. This event just keeps rolling and growing in popularity. Over 200 kids, dads, grandpas, uncles, etc. came to partake in box fort building, Lego stations, jumbo Jenga, sensory play, and so much more. And as always the pizza, pretzels, and root beer were a big hit! Once again the superheroes from C3: Caring Character Cosplay helped make the day extra special. 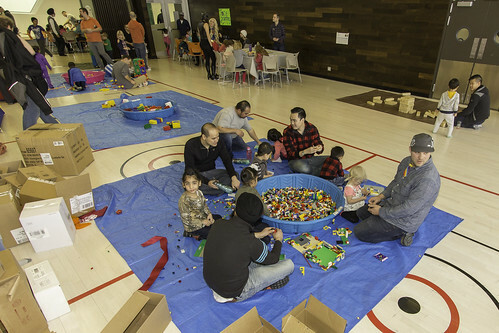 The Centre for Family Literacy was also there with a book making station, and the Alberta Father Involvement Initiative also set up shop to answer questions and talk to dads. All in all it was a fabulous time. See you next year! This Halloween, bring your little ghouls and goblins to Family Boooootures for some All Hallows’ Eve fun! There will goopy and creepy crafts and activities for the whole family. Come dressed up in your costumes and enjoy some spooky fun and some yummy treats! Are you ready for a waffle-mazing good time? Mark your calendars for our third annual Family Breakfast Event! Family Futures is excited to host this fantastic FREE family event with breakfast, crafts, face painting, and games for your whole family to enjoy. Snack on a waffle stack and get to know other families in your community. Mark your calendars for our annual Teddy Bear Picnic. Join us for an afternoon of crafts, games, healthy snacks, and Storytime with the Edmonton Public Library. Make sure you bring your swimsuits to enjoy the splash park (dependent on weather). Family Futures Resource Network would like to invite you to come celebrate the grand opening of our brand-new building, located in one of Edmonton’s fastest growing communities. Family Futures builds on the strengths of individuals and families through connection, support, and education to create a better future for everyone in our community. We are very excited to be expanding our unique programs and services to this area of Edmonton. Main program to start at 3:30 p.m.
snow-fort building; hot chocolate; and much more! FREE! ALL FAMILY MEMBERS WELCOME! Many thanks are due to Bryan Dwenychuk and Go Auto for the donation of a signed Connor McDavid Edmonton Oilers jersey, which we were able to auction off with 100.3 The Bear's help. The Bear Children's Fund generously paired the Connor McDavid jersey with two tickets to the Edmonton Oilers game on March 10 versus the Pittsburgh Penguins, and the great folks at the Canadian Brewhouse also threw in a $100 gift certificate. Thanks to the generous spirit of everyone listed above, we were able to raise $2000 to help fund some of our community-based children's programming. Yukon Jack and Ryan Maier did just a fantastic job of auctioning this package off live on-air, and also of communicating the work our agency is doing in the community; you guys rock! On Wednesday, November 22, 2017, the Honourable Richard Freehan, MLA Edmonton Rutherford, Minister of Indigenous Relations, stopped by our Westbrook location to present our agency with a Treaty 6 flag. This is quite an honour, and we greatly appreciation Minister Freehan taking the time to visit and chat with our staff about what we do as well. Our third annual Hangin with Dad happened on Saturday, November 18th at the Mill Woods Seniors Activity Centre. It was a huge success, massive amounts of fun had by everyone. Over 170 came to partake in box fort building, Lego stations, jumbo Jenga, duct tape wallet making, and so much more. They also enjoyed some delicious pizza, pretzels and root beer! We were joined by superheroes from C3: Caring Character Cosplay (Star Lord, Cat Woman, Captain Marvel, and Supergirl!). 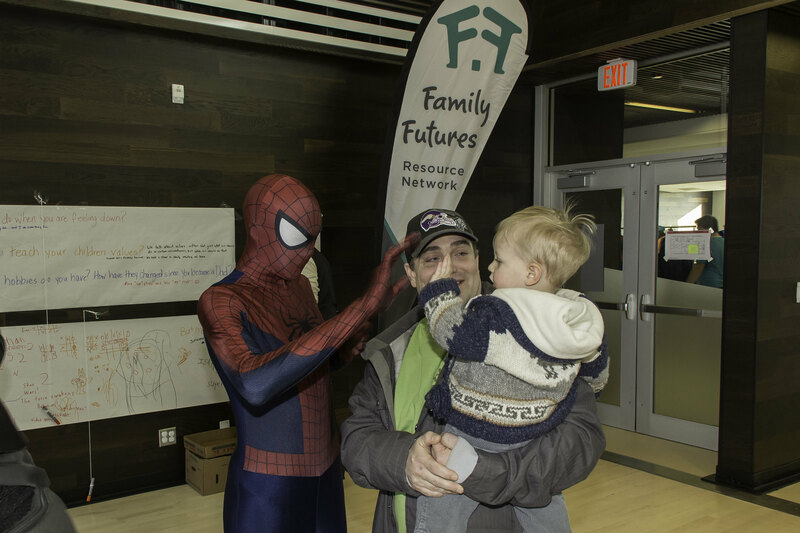 The Centre for Family Literacy was also there with a book making station, and the Alberta Father Involvement Initiative also set up shop to answer questions and talk to dads. 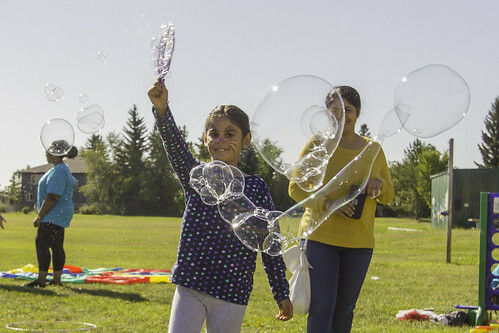 On Saturday, Aug 26, at Grandview Community Centre (12603 - 63 Ave NW), Family Futures hosted our second annual FREE pancake breakfast with crafts, games, stories, and more for families to enjoy. EPS and EFRS were there to show all the little kiddies (and some big kids too) their awesome gear and service vehicles. A "big thank you" to both! 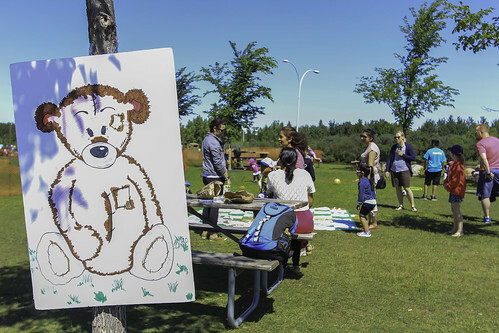 Our annual Teddy Bear Picnic at Jackie Parker Park. Over 400 lovely people joined us for an afternoon of crafts, games, healthy snacks, and Storytime with the Edmonton Public Library. On January 21, 2017 we hosted a Winter Family Play Date that featured a variety of FREE and drop-in outdoor activities for the whole family, including: snow painting; snowshoeing; snow-fort building; hot chocolate; and much more! Many thanks to the Edmonton Public Library for bringing storytime to the event, to the Honourable Amarjeet Sohi, Minister of Infrastructure and Communities and his team for collecting donations and raising awareness for the Edmonton Food Bank, and to all of our amazing volunteers for making events like these possible. WE COLLECTED A WHOLE TRUCK LOAD OF NONPERISHABLE DONATIONS FOR THE EDMONTON FOOD BANK! Pizza, Pretzels, Beer (root), Box-Fort Building, Book Making, Lego, Giant Jenga, and Superheroes! This event was a FREE half day of fun and creativity for kids (3-8 years of age) and their dads, grand-dads, or other significant male role models in their lives. Kids and their dads, stepdads, granddads, uncles, brothers, neighbours, etc, enjoyed a half-day of fun including box-fort building, constructible crafts, and open-ended play experiences facilitated by Family Futures, Centre for Family Literacy and the Alberta Father Involvement Initiative (abdads.ca), all structured to encourage parent engagement during children’s play. Edmonton's own C3: Caring Character Cosplay (the group that helped bring us Spider-Mable) was also in attendance, doing what they do best - spreading joy and inspiration throughout our community. On Saturday, August 27, Family Futures hosted a free pancake breakfast for the community. The event was very well attended, even with some grey skies. There were crafts, contests, bubbles, fire trucks and firemen, the Edmonton Public Library giving away memberships and free books, Compass for Sexual Wellness providing info ... oh yeah, and pancakes! Everyone had a great time and tons of fun. Many thanks to everyone that attended, including Edmonton Fire Rescue Services (Station 16, Platoon 3), the Honourable Amarjeet Sohi, and of course all of our amazing volunteers and board members that came out to help. See you at all of our next events! Stay tuned. The Honourable Amarjeet Sohi MP, Minister of Infrastructure and Communities, visited Family Futures Resource Network on July 21, 2016. His announcement was in regards to Canada Summer Jobs, a program that helps make a significant portion of our summer programming possible. 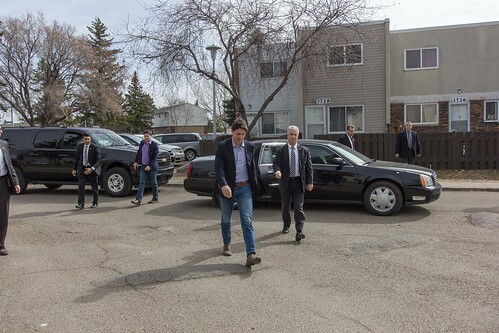 Justin Trudeau's visit made a significant impression on the surrounding community, and certainly helped in making a few more take notice of the work Family Futures Resource Centre is doing in South Edmonton. This was a major step forward for the agency in advocating what we do. In addition to Prime Minister Trudeau, also in attendance were Minister Amarjeet Sohi, Minister Randy Boissonnault, Councillor Scott McKeen, and Greg Dewling from Capital Region Housing. 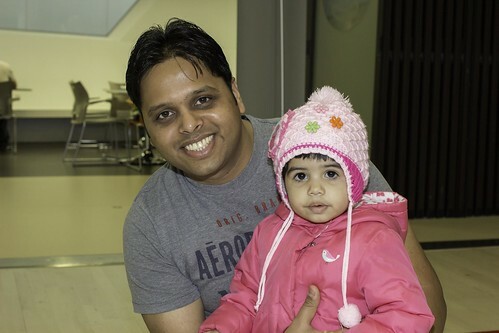 This was our second year facilitating Winter Family Fun Days in a few of Edmonton's South East communities. The community-specific funding for this was intended to help encourage outdoor physical activity for the whole family, especially during our long, cold winter months. These events were a massive success. 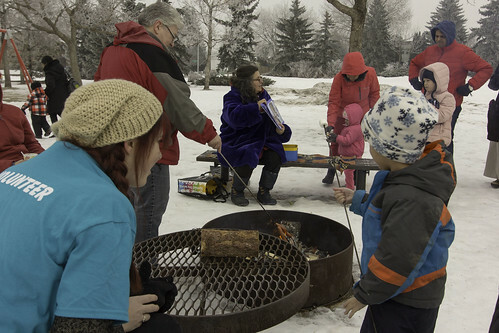 Our first event, hosted by the Knottwood Community League was a fantastic celebration of everything winter, with snowshoeing, snow painting, snow-fort building, a roaring bonfire, hot chocolate and much more. Click HERE to see some photos of the event taken by local photographer Greg Campbell. Our second event needed to evolve somewhat due to the extremely warm weather we experienced this year. 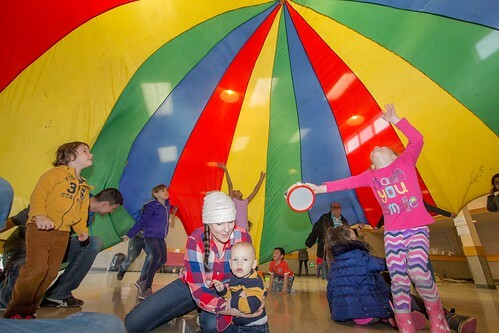 This event, hosted by the Leefield Community League, featured outdoor scavenger hunts, parachute play, and tons of other activities ... oh, and of course more campfires, marshmallows, and hot chocolate. We are extremely happy with the results and community turnout for these events. Be sure to watch for ourWinter Family Fun Days next winter. Pizza, Pretzels, Beer (root), Box-Fort Building and Superheroes! Kids and their dads, stepdads, granddads, uncles, brothers, neighbours, etc, enjoyed a half-day of fun including box-fort building, constructible crafts, and open-ended play experiences facilitated by Motivention (motivention.ca) and the Alberta Father Involvement Initiative (abdads.ca), all structured to encourage parent engagement during children’s play. Pizza, pretzels and root beer were served throughout the event to augment the fun! Watch for our next Hangin' with Dad event coming soon. Did you know Family Futures is a significant part of some Government-funded affordable housing projects in Edmonton? 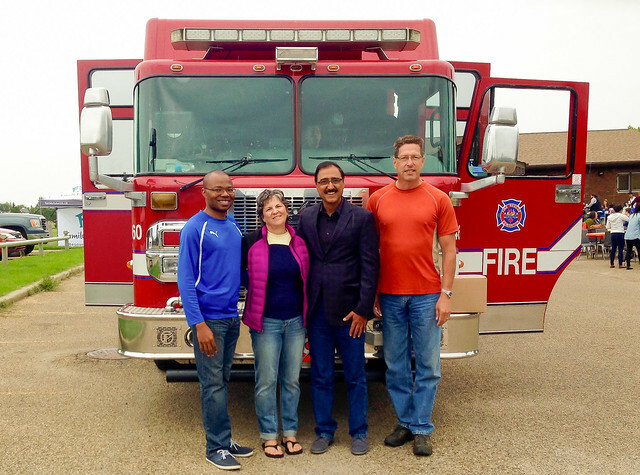 Alberta's Minister of Seniors, Sarah Hoffman, federal Minister of Infrastructure and Communities, Amarjeet Sohi, and Edmonton City Coun. Ben Henderson toured our Millbourne site located in an affordable housing facility in South East Edmonton Friday, January 15, 2016.